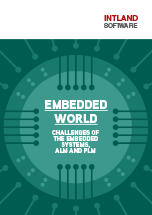 An embedded world is driven by embedded software. In the age of IoT products becoming ubiquitous, being able to develop quality embedded software is becoming a key asset. This eBook investigates the basics as well as the advanced details of embedded software development, and covers the topic of integrating PLM and ALM. The Embedded World is the Internet of Things, an industrial internet with cyber-physical systems and is a smarter connected World. The term Industry 4.0 marks a revolution in manufacturing and is based upon integrated, connected embedded systems. The complexity and volume of embedded software required is staggering and poses an exponential increase in risk for manufacturers. Nowhere is this more apparent than in mission critical embedded markets, including the automotive, aviation and medical industries. Consumer demand is driving manufacturers to create increasingly complex products by adding product features through embedded electronics and software. This greatly increases the complexity and cost of product development. To remain competitive and to reduce development risk, both Product Lifecycle Management (PLM) and Application Lifecycle Management (ALM) Software must be utilized and integrated. Intland Software provides a complete ALM software solution for mission-critical embedded markets. If this white paper made you wonder if codeBeamer ALM can help your business goals, feel free to contact us directly for a free 1-on-1 demo.